Coffee is just one of those fundamental pieces of our modern life. I'm sure anthropologists have their explanation for coffee's popularity; that thanks to our hectic, work-a-day lives, we depend on it in exchange for a healthy night's rest or less stressful jobs. But the truth is, we like coffee. There must be some watershed age where coffee becomes a necessity for a person. I remember for me it was when I started working full time in New York at the age of 24. Those winter mornings are brutal, and I needed something- anything- to keep me from shivering at my desk. As a grown man, it wasn't going to be hot cocoa. Since then I don't start my day without a cup. More than that, coffee is a simple thing that unites us across all races, ages, genders, and ethnic boundaries. Relationships start with, "Can I buy you a cup of coffee?" or "Let's talk over coffee." It's become the glue of our social society, more than alcohol, more than pop culture, more than- thank God- politics. So it's not so surprising to realize that a simple coffee chain could turn into an economic force to be reckoned with. In the fourth quarter of this fiscal year, Starbucks reported $5.71 billion in revenue. $5 billion. For a company that sells fancy coffee drinks. This isn't a major retail outlet that sells everything from clothing to turkeys. This isn't a big tech giant that sells the hottest gadgets. We’re talking about a company whose most popular product has the words "pumpkin spice" in the title. It shows you how important coffee is to America and other nations. We don't just need it to get up in the morning, we see it as an extension of our personalities, as a treat to pick us up, and as a channel through which we connect with others. That's why Starbucks is often in the center of some of the most pressing issues facing Western civilization. I know, it sounds crazy. Why should a simple coffee shop be involved in racial issues, political arguments, and cultural conflicts? This was so wildly unpopular that the company had to immediately cancel the initiative and issue something akin to an apology. But that wasn't the end of Starbucks getting thrown into the hot seat. 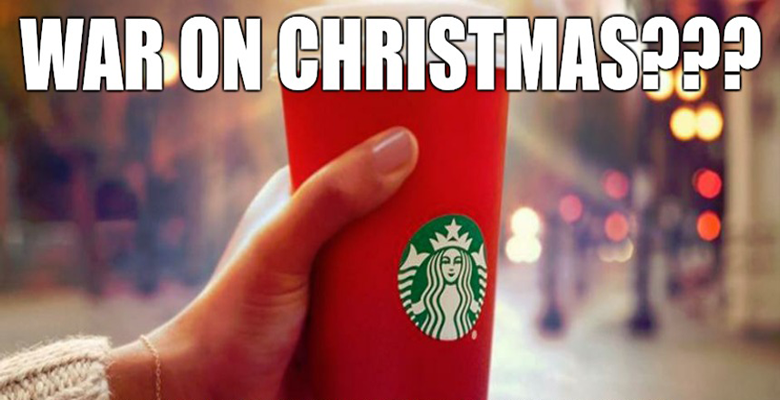 Last year they came out with a sad excuse for a holiday cup that incited even more controversy. In the past, Starbucks was decent enough to have Christmas-themed images on their cups. Fitting, considering it was Christmas time. The move to a generic looking red cup, void of anything related to Christmas, was seen as a pathetic move to placate non-Christians or anyone that didn't celebrate the holiday. While it's true that other holidays fall around the same time as Christmas, the majority of Americans celebrate it during the month of December. The massive spending sprees that buoy our economy around this time of year are thanks to the tradition of giving gifts on- wait for it- Christmas morning. The decorations, music and overall spirit of this season are directly connected to the celebration of the birth of Christ and the many, many cultural artifacts associated with that event. I have many friends and family from all walks of life, including those that are Jewish and Muslim. They've never expressed outrage that America celebrates Christmas (in fact, many of them participate in the holiday). They aren't offended if a cup has a picture of a reindeer or a manger on it. The only people who seem to get up in arms over this are secular, white liberals. Who cares what they think, anyway? This year Starbucks has tried to minimize the drama by letting customers design the cups. This year, for the first time, Starbucks red cups will feature designs created by customers with 13 distinct cups in stores starting tomorrow (November 10). Guess what designs the customers came up with? Christmas! Among the various designs were reindeer, snowflakes, Christmas tree lights, and other symbols of the holiday. Are you at all surprised? You shouldn't be. Now that we just had a historic election, one that upset and disrupted the media elite's stranglehold on our society, Starbucks is back in the spotlight. Starbucks customers across the country have begun placing orders under the name ‘Trump,’ forcing baristas to shout the President-elect’s name when drinks are ready. A Starbucks employee sparked controversy earlier this month when he called the police on a Donald Trump supporter. Operation #TrumpCup is an apparent backlash against that incident as well as other cases of discrimination against Republicans. It’s spread like wildfire across the internet, becoming a phenomenon almost overnight. It started as a simple joke, to get predominately liberal baristas to shout out the name of the next President of the United States. But when one triggered snowflake called the cops (I'm still laughing about that), the forces of the right banded together to take a stand. What's amazing about this is that it will only help Starbucks rake in the cash. When the left protest, they cause havoc. When the right take a stand, it only means good things for the economy. So it seems Starbucks has become a place to discuss our views, without the involvement of its CEO, after all. They tried to force people to express their opinions, and it failed spectacularly. Now people are taking the initiative to make the chain of stores a place where people can freely express their support of the incoming President. That's something to celebrate, isn't it? In the end, regardless of politics or cultural disparities, coffee shops will always be a place Americans gather together. As we pump caffeine into our veins, we will join together for the common virtues of life, liberty, and the pursuit of happiness. And to buy the latest Buble CD.